This book provides the first systematic critique of the concept of climate change adaptation within the field of international development. Drawing on a reworked political ecology framework, it argues that climate is not something ‘out there’ that we adapt to. Instead, it is part of the social and biophysical forces through which our lived environments are actively yet unevenly produced. From this original foundation, the book challenges us to rethink the concepts of climate change, vulnerability, resilience and adaptive capacity in transformed ways. With case studies drawn from Pakistan, India and Mongolia, it demonstrates concretely how climatic change emerges as a dynamic force in the ongoing transformation of contested rural landscapes. 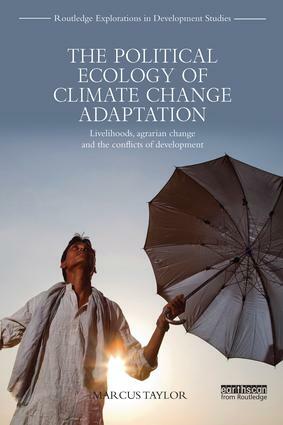 In crafting this synthesis, the book recalibrates the frameworks we use to envisage climatic change in the context of contemporary debates over development, livelihoods and poverty. With its unique theoretical contribution and case study material, this book will appeal to researchers and students in environmental studies, sociology, geography, politics and development studies.